Alkaline solutions of aluminum and sodium ions form complex gels (see example) composed of aluminum metal center networks. 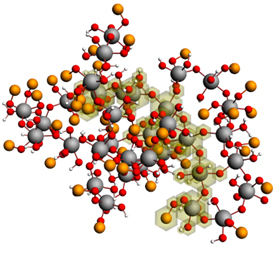 During crystallization, these networks release ions whose structure is influenced by the presence of large concentrations of sodium ions and solute/solvent organization. Enlarge Image. Researchers at the Interfacial Dynamics in Radioactive Environments and Materials (IDREAM) Energy Frontier Research Center quantified transient penta-coordinated Al3+ species during the crystallization of gibbsite from hydrous aluminum gels in solutions of concentrated sodium hydroxide. The research shows that concentrated electrolytes in solution affect hydrogen bonding, ion interactions, and coordination geometries in currently unpredictable ways. Why It Matters: These mechanistic studies support the development of new process flow sheets to accelerate the processing of radioactive wastes at two Department of Energy sites. Further, the studies may provide less energy-intensive routes for industrial aluminum production. Summary: Gibbsite (α-Al(OH)3) is an important mineral resource for industrial aluminum production. It is also present in large quantities in the high-level radioactive waste tanks at U.S. Department of Energy sites in Washington State and South Carolina. Traditional processing for either aluminum production or radioactive waste treatment is an energy-intensive activity. Processing involves heating to facilitate dissolution of gibbsite in highly alkaline solutions of concentrated electrolytes. Heating is followed by cooling to encourage precipitation from these chemically extreme systems. For radioactive waste treatment, the dissolution and precipitation steps are often quite slow. Why? In part, both processes involve changes in the coordination geometry of the trivalent aluminum. In the solid phase, it is six coordinate to give an octahedral geometry. To move into the solution phase, the aluminum ion must change its geometry to a four-coordinate tetrahedral form. Led by Dr. Jian Zhi Hu and Dr. Kevin Rosso, the team conducted high-field magic angle spinning nuclear magnetic resonance spectroscopy studies that probed ion interactions, solute organization, and solvent properties during gibbsite precipitation. The team captured real-time system dynamics as a function of experimental conditions, revealing previously unknown mechanistic details. The team's work shows that the change in coordination is not a simple transition between the tetrahedral to octahedral species. The change involves an intermediate penta-coordinated aluminum metal center. Further, these species are influenced by subtle changes in solute and solvent organization. These changes lead to gel networks that can sometimes facilitate formation or dissolution of the solid phase. Understanding how aluminum coordination changes in extreme environments may lead to efficiencies in aluminum production and accelerate radioactive waste processing. User Facility: Materials characterization and nuclear magnetic resonance measurements were performed using EMSL, a national scientific user facility sponsored by the Department of Energy, Office of Science, Office of Biological and Environmental Research at Pacific Northwest National Laboratory.